After 3.5 years, we’re getting a new installment in the Far Cry series. This time, we’re getting away from the tropical islands and we’re going to Montana, USA. But as with every new game with gorgeous visuals, there’re plenty of people looking to upgrade their current gaming rigs. If you’re looking for a laptop that can keep up with what Far Cry 5 can throw at it – you’ve found the right place. In this guide, I’ll take you through the essential and optional requirements for the best laptop for Far Cry 5, what is particularly important when you’re buying a laptop and at the end I’ll narrow it all down to top 6 picks of 2018. Let’s start off with the Ubisoft’s requirements for FC5. First of all, let’s begin with the official requirements for Far Cry 5. I have derived these laptop requirements based on their official PC requirements by matching components to their equivalent laptop parts. I used 3rd party benchmarks including 3DMark and PassMark tests. What is crucial for a gaming laptop? Far Cry seems to be well optimized for a multi-core setup. Running Far Cry 5 shifts my processor into an overdrive. There aren’t many processors that can handle FC5 on higher settings. For low settings, sure even a mid-range i7-7500U with a good graphics card will do the job. But please rememeber that you shouldn’t pick a laptop that has restricted airflow, that will result in unplayable lag spikes. So if a sleek ultrabook comes with an i7-7500U (or even a better processor), it will struggle immensely to play Far Cry even on the lowest settings. There’s no way around it, integrated graphics have 0 chance to properly run FC5. We’ll need a graphics card that can match the Far Cry visuals and I heavily recommend going for 10th gen Nvidia graphics. There are only a few cards from AMD and Nvidia’s 9th generation that I could recommend for contemporary AAA gaming titles. We can’t just copy desktop card requirements since desktop graphics cards are different from laptop graphics cards even if they share the same model name. Nearly every desktop GPU on the market is overclocked and laptop graphics are either stock speed or underclocked to minimize heat (Nvidia’s Max-Q cards). Memory is the easiest requirement to get right. Just make sure you’re getting at least 8 GB of RAM. Far Cry 5 uses ~2-4 GB of RAM so it’s not particularly demanding in this regard. For most gamers I recommend buying a laptop with 16 GB of RAM for fluid multitasking and future-proofing. Ideally, I would go for 32GB DDR4 2400MHz+ on 2×16 GB setup as 99% laptop CPUs support 2 and only 2 memory channels. 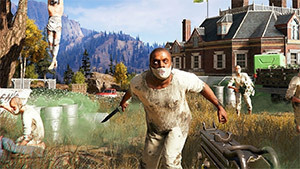 Even though it’s not mandatory to run Far Cry 5, a fast storage drive will help immensely in every-day tasks and it’s a great way to extend the lifetime of a computer. Unless you can’t spend more than $1,000 – go for a laptop with an SSD. And even if you can’t afford one right now, at least get a laptop with a free SATA 2.5″ bay or M.2 2280 slot. These are the 2 most common ways that will let you upgrade your laptop with more storage. So either get a laptop with \[500 GB SSD\] or \[1 TB HDD and a free slot for storage expansion\]. Ideally, I’d go for a NVMe or at least PCIe Solid State Drive as these often surpass the older SATA SSDs in speed. But that’s only a minor bump in performance compared to the jump from an HDD to any SSD. Far Cry 5 requires great cooling. Even my desktop PC with 6 cores maxed out every core and forced me to clock my CPU down to stock speeds. Even a moderate overclock would result in a thermal throttle when CPU hits 100 degrees. Now imagine how much it would throttle a laptop! Far Cry is great at utilizing the CPU. Which can result in a quick jump in temperature and eventually thermal throttling. I see no other way but putting a framerate lock at around 60 FPS for even the fastest laptop with a high refresh rate panel. Another way is to set refresh rate to 60 Hz and turn on V-Sync. All of these settings are available on Far Cry 5 menu by clicking Options > Video. If you want to go beyond 60 FPS, you’ll need top of the line cooling. And cooling is bound to a laptop’s size. That’s why I won’t recommend ultrabooks and I’ll lean to heavier laptops with better airflow and preferably 2 fans. If you want the perfect laptop for playing Far Cry 5, you can’t forget about the display. A high “quality display” is not as easy to pinpoint as a “fast processor”. I’d need to double this guide in size to give a rundown through display metrics that are important to overall display quality. But to make matters simple, I’ll just focus on 3 basic metrics. First and foremost, I’ll cover the resolution. Pretty much everyone knows about it and it can be very easily evaluated. There are only 2 camps of laptop displays: 1080p/FHD/1920×1080 and 2160p/4k/3840×2160. Somehow producers forgot about the in-between 1440p resolution but that’s OK – it makes matters easier for us. If you don’t care about 4k, then that’s it – just for a 1080p display there’s nothing for you to worry about. But if you want a crisp 4k display, make sure you’re getting a true 4k panel. “Fake” 4k panels? What am I talking about? I’m talking about laptops with PenTile pixels instead of traditional RGB pixels. I won’t bother much with how they work but they look noticably worse when displaying some sharp details with particular color combinations. Some laptops from HP, Lenovo and many Asus laptops come with PenTile pixels which are not much better than the regular 1080p. How to know if it’s “fake 4k”? Well, you’ll need to Google the model specification sheet and its reviews before entering your credit card details. You might want to add “subpixel array” to your search. If you ain’t got time for that, there’s a short list of laptops that come with faux-4k panels. The good news is that if you’re buying a 4k laptop, these days that usually means you’re getting the real deal unlike you would when buying a 2014-16 laptop. Not all 4k panels are equal. Panel type is the easiest way to quickly evaluate laptop’s display quality. There are 2 types of panels in modern laptops – IPS and TN. I’d recommend TN only in very specific situations such as budget laptop or a mid-range laptop with 120Hz+ refresh rate. For everyone else – I’d just go for an IPS display. It provides better color contrast and viewing angles. If laptop’s page mentions that it has an IPS panel – most likely it’s at least a decent display. But if a display has no trace of “IPS” in the description – display quality can range anywhere from good to atrocious. And do not get tricked by “IPS-like” displays. MSI tends to use this trick a lot in their mid-range gaming laptops. They’re not “IPS” and they have nothing to “like” them for. If you’d compare the displays of premium gaming laptops of 2014 and 2018, you’d find one clear trend – a sharp increase of high refresh rate displays. These displays were limited to enthusiasts and professional gamers but now the’re riding the hype wave to desktop & laptop displays, smartphones and even Apple products. High refresh rate in consumer LCD displays is the latest gaming feature that has reached displays in the last decade. It makes any game feel a lot more responsive especially if you can hit the triple digit framerates. Sadly, Far Cry 5 is not the best game to try out a high refresh rate panel. Even a desktop i7-8700K + 1080 Ti setup can hardly keep up with a 144Hz monitor. But if you play other first person shooters then I would recommend trying out a laptop with a higher refresh rate if that does not mean adding more than $300 to the bottom line. I know I said I’ll just cover 3 key features of a quality display but there are a few basic rules of thumb to avoid the bad displays. Whenever possible, check the reviews whether the display is “washed out”, very dim or difficult to work with outside. If you’re spending over $2,000 on a laptop, you should expect the display to be the opposite of “washed out”.